I love you. I really love you. You’re always there for me, even on the days when you’re hiding. But tonight you’re up and full, shining a big ring through the clouds and I’m singing to you again. I want to tell you why I’ve got this bit of broken glass. Do you like my singing voice today? I’m making it as good as I can. Sorry if it seems a bit sad but I’ve worked out where Luke is. I miss him so much. He was always there when boys bullied me or bigger girls shouted at me to make me cry, standing in a circle around me and being horrible. Sometimes when I was sad he’d put an arm round me. He was good then, those times. He showed me how to make a daisy-chain once. I wish daisy-chains could last for ever. I’d wear it all the time. When he ran away from the home I thought he’d come back the same day but he never did. I spent ages and ages walking through the lanes. I wanted to have my feet going the same places he must have been. I used to think he’d come back for me some day maybe when he was grown up but I don’t think he will now. The last bit of cloud has gone. I can see you clearly. Do you remember all the wishes I made? To you, about Luke coming back, always being with me? You know, that he’d be there when I was sad or people were shouting? Remember he ran away after the woman told us a story about a gingerbread house and a witch? She doesn’t come to the home to tell stories any more but I met her today. She was having a picnic by her house all by herself, you know, on the bank by the big pond. She smiled and waved and called me over. She asked if I was hungry and I was. She said I could have a sandwich and I did because I knew her and she used to come to the home so it was alright. She said we needed vegetables with our cheese and showed me how to know what daisy leaves and sorrel looked like. She showed me lots of other plants that you can eat too. She said they were very good for you but told me off when I ate a bit of forget-me-not, and said that buttercups were poisonous. We talked about stories while we had our sandwiches. She said she must seem like a witch – living all alone in a wood and eating wild plants. I said she was too beautiful to be a witch and she laughed. I asked her if she was married. She said, no, and that she didn’t like men because they just took from you and boys were thieves too and were only good for grinding up to feed the soil. She laughed and laughed and ruffled my hair. So that’s what I worked out today. She is a witch and eats boys by feeding them to plants. And that’s the way she made me eat Luke. She’s evil. When I got back I told the staff but nothing happened except they called my personal carer and she said I need to go back on therapy. You’re the only one that listens. If she did feed the plants with him and I ate the plants … have I done a very bad thing? I have no mum and dad and I think the witch killed Luke so I don’t have him either. That’s why I’ve got this bit of glass. Some of the older girls cut themselves. They say it helps with the loneliness. I’m going to try it too. It really hurts but they said it has to. Sorry I’m only talking now. It’s hard to sing and do cutting. Oh … a drop of blood is coming out … and another. I hope I don’t get told off for this. Moon, are there supposed to be things coming out of my blood? Look, on my wrist. Two tiny things, can you see them from so far, far away? If you can’t… one is green, um, they’re both green but different. I don’t think it’s right that green blobs should grow out of my blood. Should I tell someone? But I’ll really get told off then. Moon, one of them is … look, it’s opening; it’s a tiny flower: a daisy! 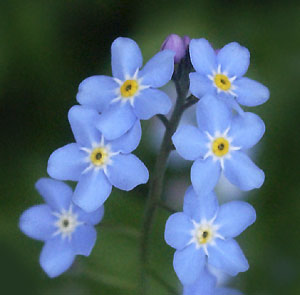 The other one’s a forget-me-not.